Thanks to an amazing co-op in Albany, I’ve discovered the joys of bulk food shopping. 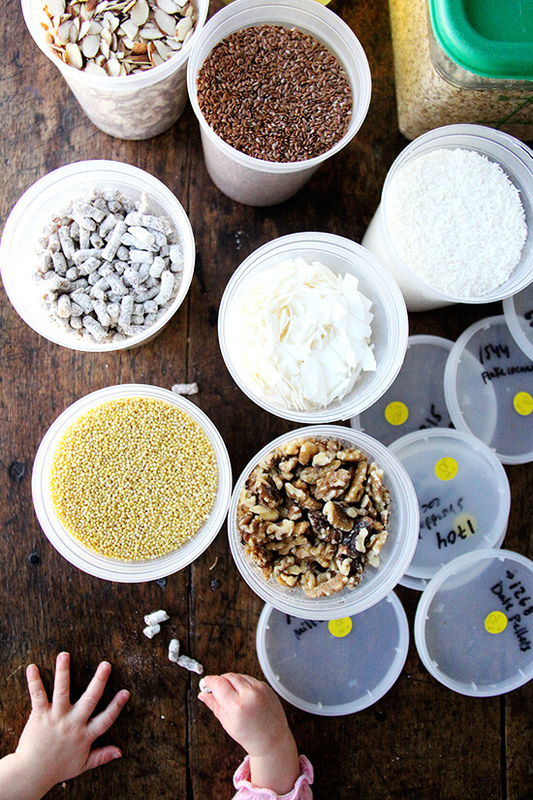 A quarter (wild guess) of the 31,000 square feet that is the Honest Weight Food Co-op is lined with tubes, bins, and barrels holding every nut, seed, grain, flour, pasta, oil, butter, extract, paste you could imagine. It’s an astonishing site — really, I’ve never seen anything like it: whole aisles dedicated to unpackaged food, which you can cart home in your own vessels or in an array of glass jugs and jars sold at the store. I had never found myself drawn to bulk food shopping until I started making this toasted muesli (granola, really), which everyone in my family adores. It’s truly the only thing I make that instantly silences my children, that keeps them sitting at the table focused on what’s before them, that they invariably ask for seconds of. 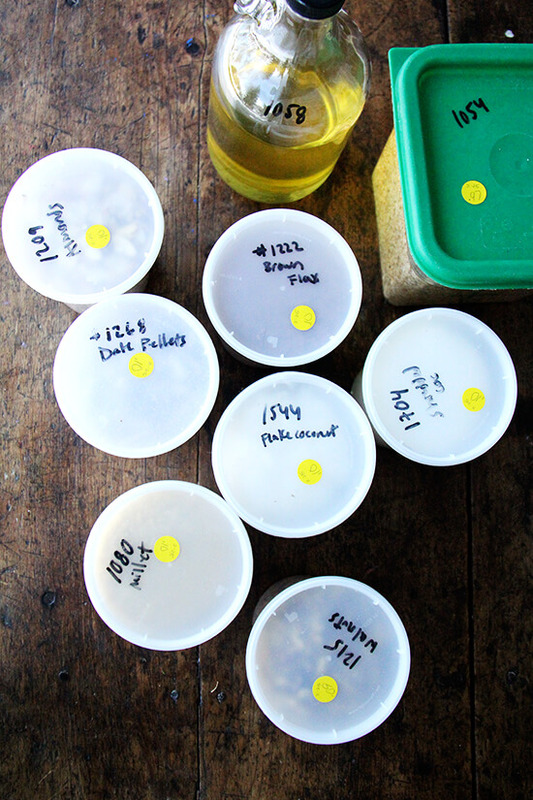 When I found myself making double batches of it twice a week, I started paying more attention to the prices of the teensy bags of almonds and flaked coconut and large jugs of maple syrup I was ripping through. I’m stating the obvious here, but bulk shopping is the way to go for these sorts of ingredients, and while I am by no means suggesting that shopping at HW will save you money, shopping their bulk section (or your store’s) will. 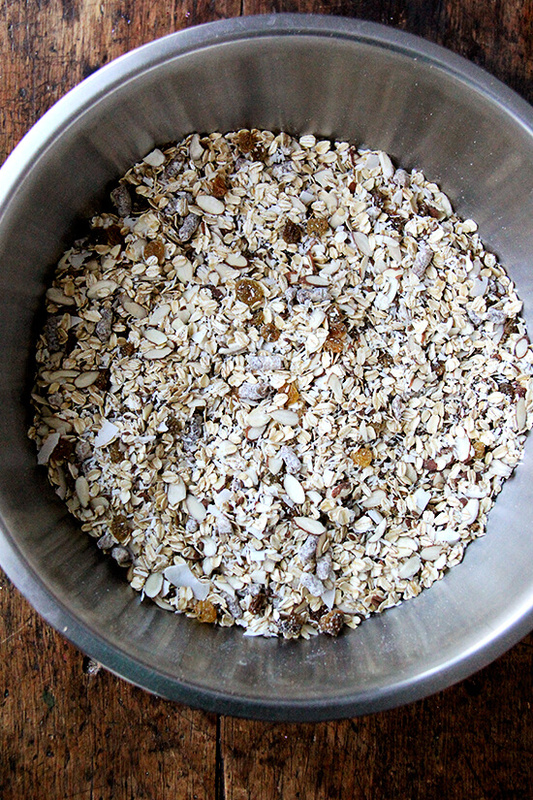 The other breakfast staple in our house is muesli — traditional muesli — a mix of raw oats, nuts, seeds and dried fruit. I learned how to make it, or actually Bircher muesli, many years ago from a tired, talented, disgruntled French man, Chef Pasche, who was working a second job as an instructor at the culinary program I was attending in South Philly. There are countless ways to make Bircher muesli — my friend, Talley, who lives in Switzerland wrote about it last fall — but the basic idea is that you throw raw oats, nuts, and dried fruit into a bowl and soak them in milk. Chef Pasche always added a grated apple and whatever fresh fruit was in season — oranges in the winter, berries in the summer — as well as grapes (which he peeled!) and a handful of sugar. Sometimes he stirred in yogurt. 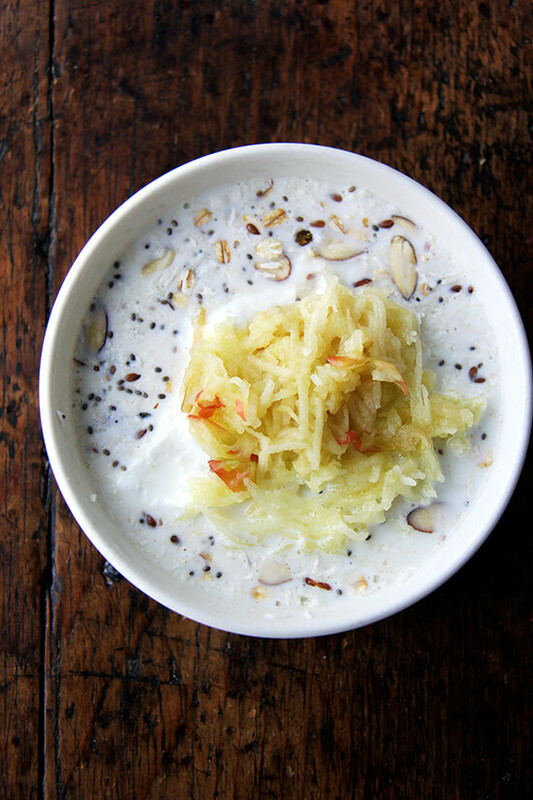 For awhile I would make the Bircher muesli in small batches, throwing handfuls of oats, almonds and coconut into a bowl, dicing up dates and grating apples, letting it all soak with milk and yogurt until the oats softened. 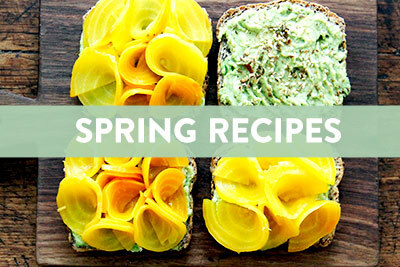 But with mornings getting busier and busier — lunches to pack! coffee to brew! 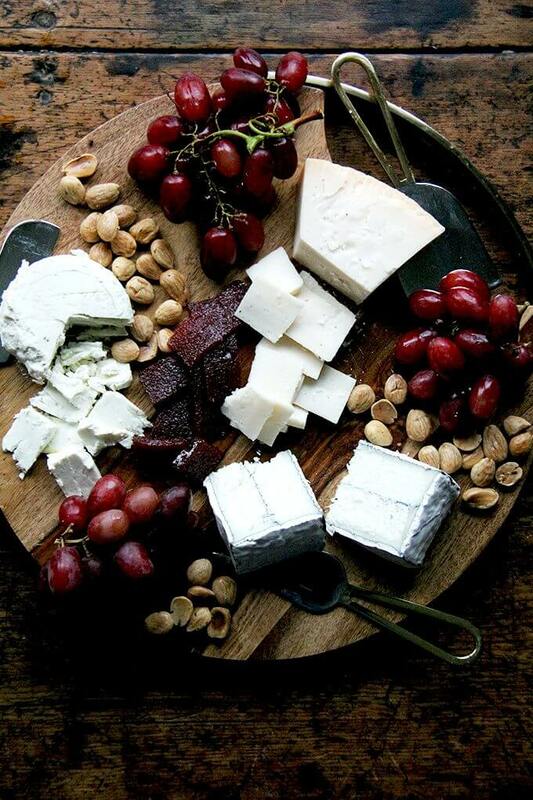 — gathering ingredients, cutting and grating became such a chore. Now, to make things easier in the morning, I make a big mix of muesli using oats, unsweetened shredded coconut, flax seed, chia seed, sliced almonds, golden raisins and date pellets (an amazing discovery — I find cutting dates to be such a pain). I never measured my mix until I thought it would be fun to blog about, so please use the ratio given below as a guide. Add more oats, use other nuts, omit the chia if you think it’s weird, etc. It’s so nice having an enormous vat, hideous storage container and all, of muesli sitting on my counter — truly, I feel lost in the morning when we are out. I love bulk shopping, but bulk shopping with children is not ideal/maddening/impossible. What is so nice about the HW co-op is that you can bring in your own vessels. When you arrive, someone will weigh/tare your containers so you’re not charged for the weight of the vessels. And then off you go. I now arrive with a 4-qt Cambro, which I fill with oats, a dozen or so quart containers (the same ones I use for soup and stock), and a glass jug or two, all of which I have marked with the correct PLU numbers/names, which makes shopping the bulk section a breeze. I know all stores don’t allow you to bring in your own vessels, but it might be worth asking/requesting because it is a serious time/headache saver. As I mentioned above, this is the first time I’ve measured, so adapt the recipe to your liking — this is purely meant to be a rough guide. Any number of nuts, seeds, dried fruit, etc. will work. Also, wheat flakes, oat flakes, etc. can be added. 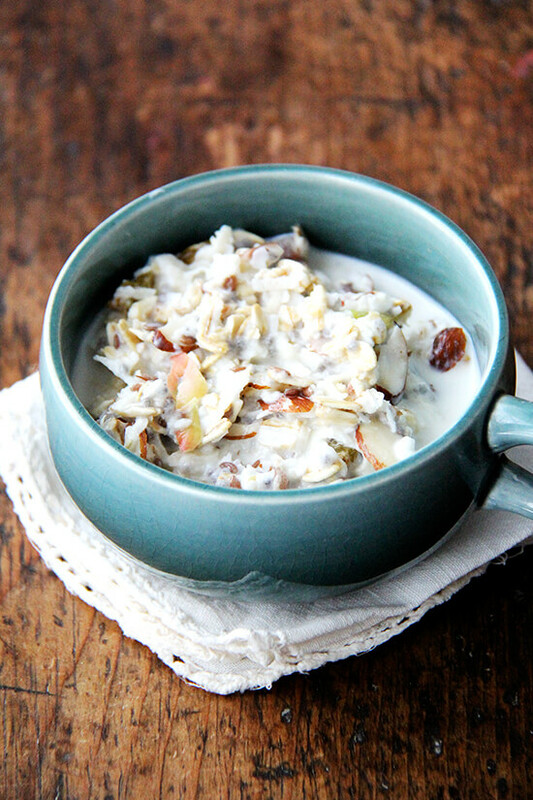 Bircher muesli is a great thing to make for a crowd. Last summer I reunited with some dear friends at the beach, and I made a huge batch of this every morning. 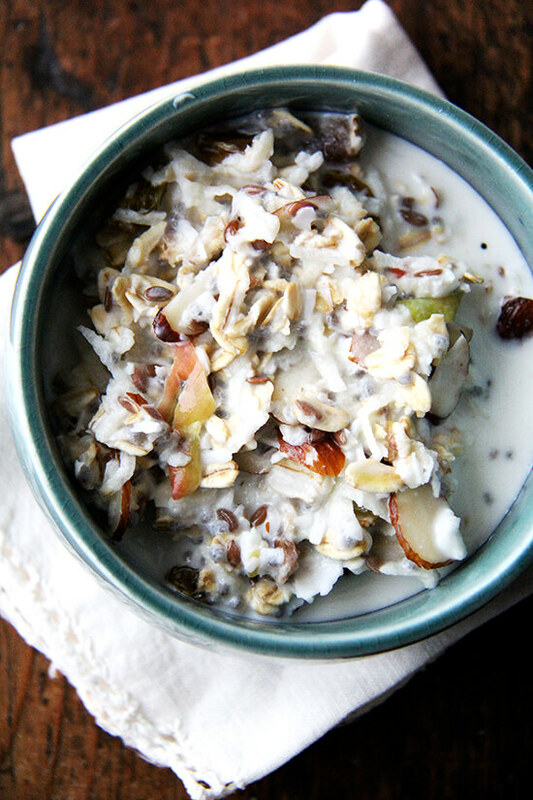 Count on 1/2 cup of the dry muesli mix and 1/2 grated apple per person. If you’re not using date pellets, I like to use one date per person for sweetness. You don’t have to measure, but I basically do a ratio of equal parts milk to muesli, then half as much yogurt, but again, adapt recipe to your liking. 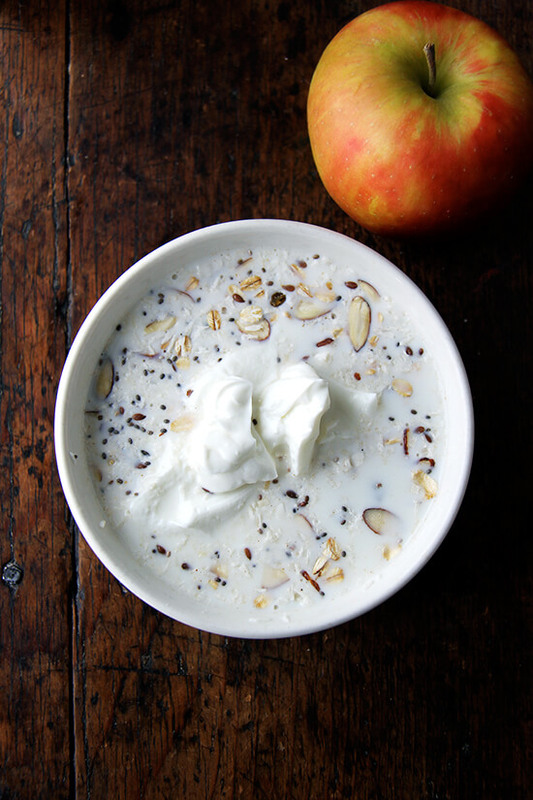 Also, on a daily basis, I just soak the muesli in milk for about 15 minutes — no apple, no yogurt. For me, I’ll soak 1/2 cup of muesli with 1/2 cup of milk for at least 15 minutes. Sometimes I add more milk if it has gotten too thick. It is delicious on its own just like that, though the apple provides a nice sweetness and the yogurt, a nice creaminess. 1. 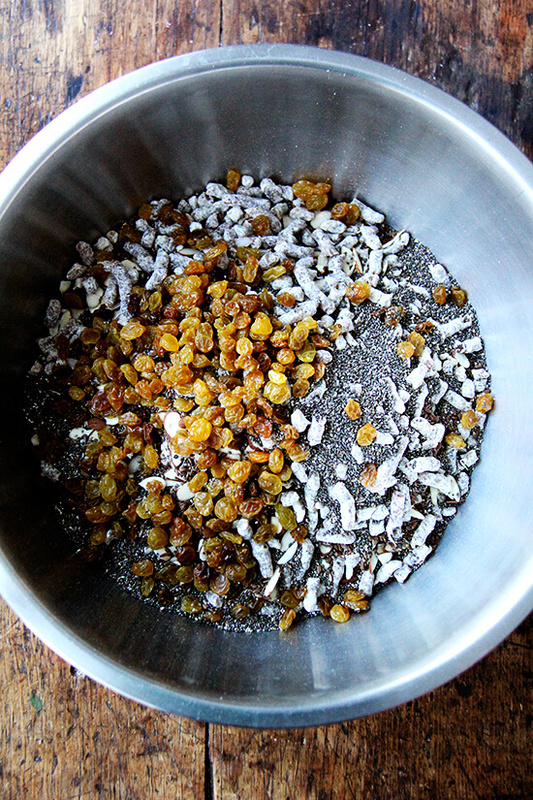 Mix oats, coconut, almonds, flax seed, date pellets, chia, and raisins in a large bowl, then transfer to storage container. 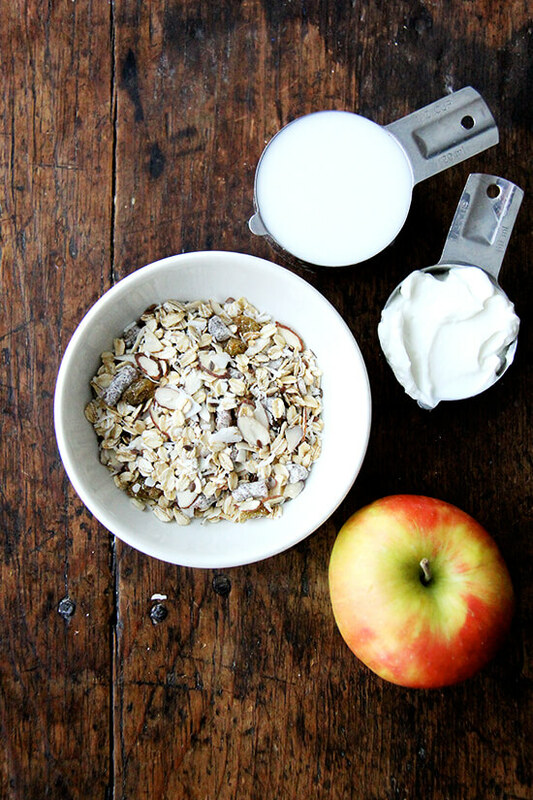 To make an individual serving: Mix together the muesli mix with milk, apple, fruit and yogurt. Let sit for 15 minutes at least before serving. 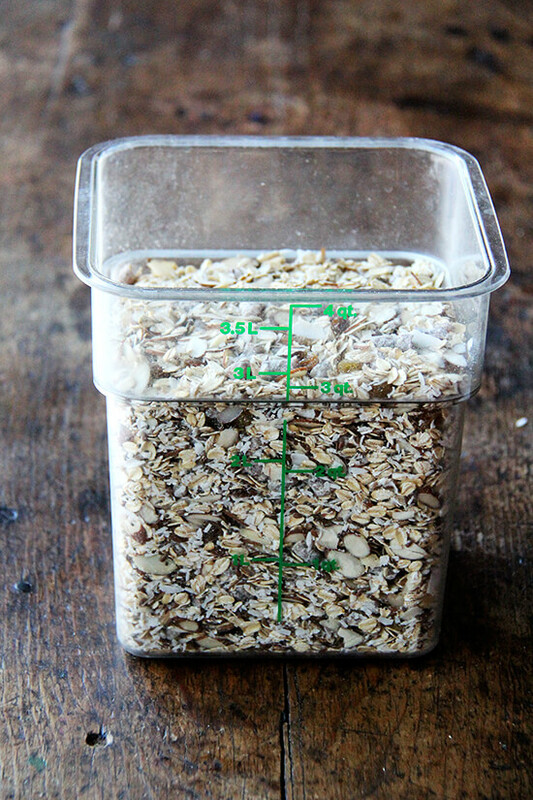 *If you haven’t made the muesli mix, just use 1/2 cup oats and a pinch of any nuts, seeds, dried fruit, etc. you have on hand. Before I discovered date pellets, I would just chop up a date — one date per serving/person. Since I discovered your granola, it is always in our cupboard. I think it’s the millet, both the grains and puffed — makes it less dense and just the right amout of decadent. But it’s a weekend “treat.” The museli looks like perfect daily fare. Thanks! This makes me so happy, Patty! I love the millet, too — it’s the best/most surprising part. We are hooked on the muesli, too. I just squealed!!! I got back from Austria and Switzerland on Monday and have not been able to stop thinking about the bircher muesli that I had there! SO GOOD. Thank you sooo much for this recipe!!! Molly, I saw your beautiful pictures! The trip looked like an absolute dream. I can only imagine what real Bircher muesli must taste like. So fun! 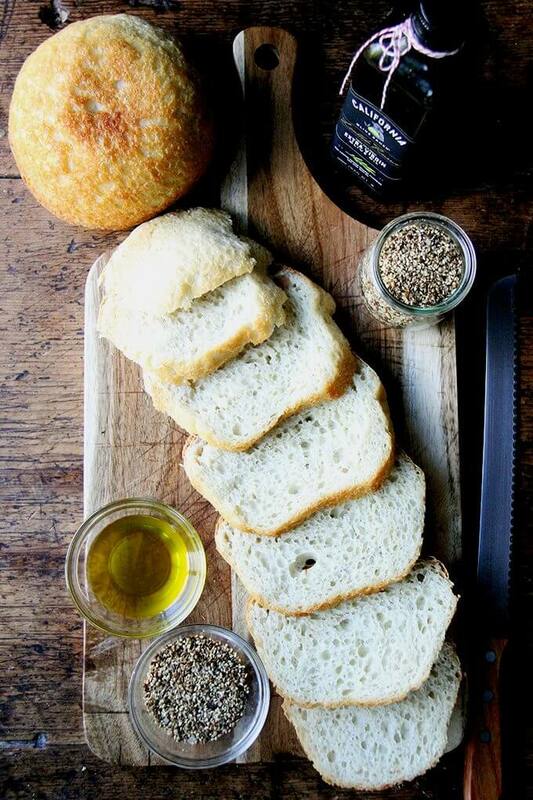 Thank you, thank you…can’t wait to make these! I’ve been making the same granola recipe for too long. These will be a welcome change! Hi Stacey! 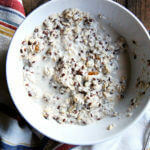 The toasted muesli (granola) is a huge hit here — my kids love the millet. This looks amazing, but I really can’t stand yogurt in any way shape or form. I use tofu in my smoothies, instead of yogurt like some people, but don’t think tofu would work in this. Any suggestions for a substitute for the yogurt or would it still be good without. I love muesli also and can’t wait to try this. Now if I just can wait 15 minutes! What a beautiful dish. 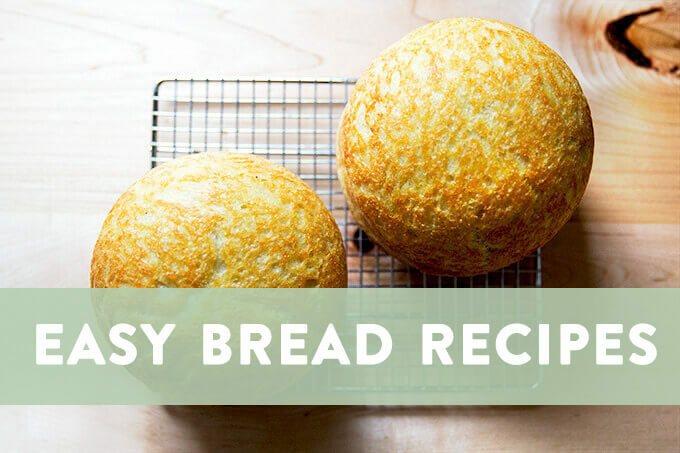 I love all of the flavors and textures and would love to have a container of this in my cupboard! Wow, so this cereal has a proper name! We make something very similar at home that we just call our mega-mix, but we don’t let it soak in milk. I’m going to have to try it with all your lovely additions! I really like the idea of shredded apple and the addition of the seeds! Mostly we mix together raw oats, grape nuts, shredded wheat, almonds, walnuts, raisins and dried cranberries! 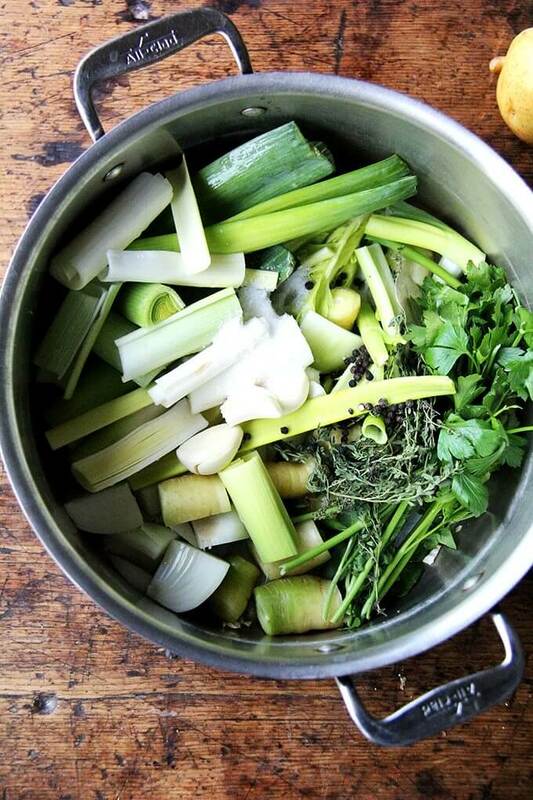 I’ve recently begun sourcing from the bulk section as well–it saves so much money! I have to tell you how much I enjoy your blog ! 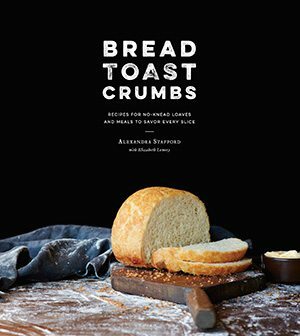 Your photographs, recipes and writing are delightful. I look at your blog and feel refreshed by your humor, creative ideas and your lovely spirit which shines through all you share. And it was the lovely Tribbie who first introduced me to your blog ! 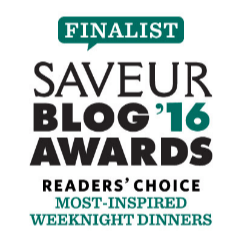 So thank you for sharing so much with us, your readers ! My husband and I were granola-loyal until we had breakfast at the Elways restaurant at the Denver airport for the first time. My husband ordered their muesli which came with a little pitcher of warm cider and a side of berries. It was wonderful! We’ve been converts ever since. Mostly now we eat it with milk or yogurt, but when we have it around, the warm cider is especially nice and different. Wow what a great recipe- I love when I can prep things in bulk and just toss it all together in a hurry. This is wonderful and such clean food to start the day with. Can I ask where you buy date pellets from? I don’t seem to be able to find them in my bulk food store. I made this bulk mix last night and my fella and I both had some for breakfast this morning – it was delicious, we had it with almond milk and fresh blueberries. So good! Yay! So happy to hear this Jessie! I am addicted to it — I can’t start my morning without it. I have made this at least three times now for breakfast and it is so good. I love the combination of milk and yogurt, plus the grated apple and dates. Just the right amount of sweetness. 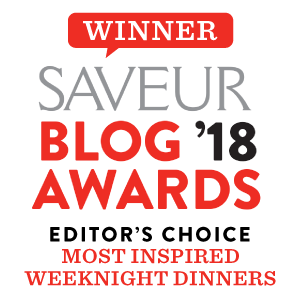 By the way, I really, really love your blog. So many of your recipes have made it into my regular rotation (summer vegetable strata, toasted muesli, oatmeal toasting bread (I make this every week! ), baked eggs (our new Christmas morning tradition), paul steindler’s cabbage soup, and the slow-cooked tuscan kale with pancetta and a poached egg (I omit the breadcrumbs and serve mine over polenta), rosemary shortbread, alice waters’ potato gratin, farro salad with pine nuts, currants, and mustard greens), just to name a few. And I saw that your favorite chocolate chip cookie recipe is also the same one I have been using for at least 8 years now. I just wanted to let you know how much I like your blog. Thanks so much for all the great recipes. where can I find date pellets? They can be hard to find. I buy them in bulk from my co-op, but my sister buys these online from Amazon. This with Almond milk soaked over night then dressed with the yogurt and fresh berries. and one of the lovely syrups of fruit you make Alexandra. it cuts like a little square when cooked then cooled. just delicious. . If you don’t feel like grating apple in the morning, do what I do: I soak the oats in just a little milk, put the rest (and yogurt) into my VitaMix, just quarter and core the apple and add it, and whiz it up and pour it onto the oats. I also add cinnamon, flaxseed meal, maybe a wee bit of sweetener, and then for just the last few seconds a handful of walnuts, jus enough to chop them without pulverizing them. Then I pour it onto the oats and add berries, orange sections, and/or whatever other fruit I want, plus a little toasted wheat germ and maybe coconut. Being mostly vegan in recent years, I use almond or coconut milk and homemade soy yogurt. This all sounds so good, Madeline. I use unsweetened almond milk now in my muesli, too. Not vegan, but trying to take small steps where I can. My daughter and I love overnight oats and any combination practically of oatmeal. So I am very excited to try this muesli recipe. Thank you for posting. It’s a go-to for me! hello!,I like your writing very much! proportion we be in contact more approximately your post onn AOL? Maybe that is you! Taking a look ahezd to see you.